The following is a list of immediate and basic shelter needs. Basic shelter needs are items we are always in need of. The immediate shelter needs list will be updated monthly. 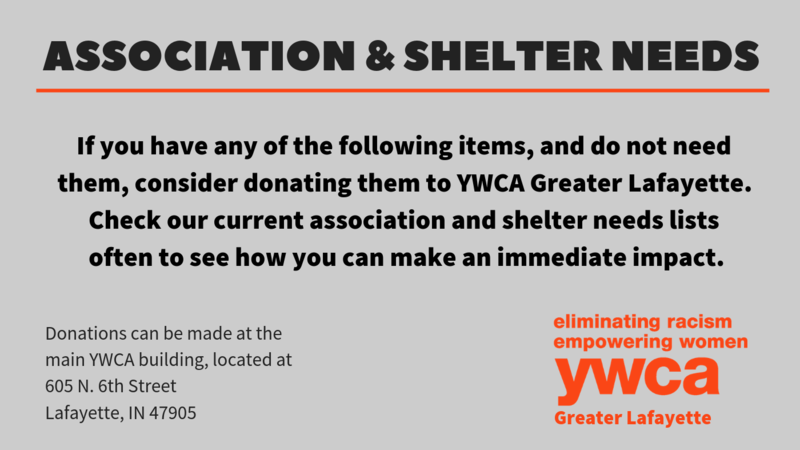 Association needs are items that may be in need overall for any YWCA Greater Lafayette program, not just Domestic Violence Intervention & Prevention programs. All items may be brought to YWCA main office, Monday – Friday 8:30 am – 6:00 pm. Don’t have time to drop a donation off at YWCA Greater Lafayette? Consider shopping our Amazon Wish List! Add an item to your Amazon cart and have it shipped directly to YWCA Greater Lafayette. Donating much-needed items for our Domestic Violence Program has never been easier! If you have any questions, or would like to organize a group donation drive, please contact Ericka, our Shelter Director for domestic violence supplies or Janae, Facilities Director, or general YWCA association needs.